The outspoken leader of the Indigenous People of Biafra Nnamdi Kanu has raises a fresh alarm over an alleged discovery of dead bodies dump inside ditches in Aba believed to be that of the members of the Indigenous people of Biafra. Alexreports gathered that Nnamdi Kanu, who is championing Biafra movement, told Arutz Sheva, an Israeli media network identifying with Religious Zionism on Tuesday that members of a crypto-Jewish group within Nigeria's Igbo minority have been targeted by Islamists in a recent string of mass-killings. 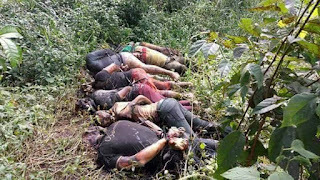 The bodies, he said, were found five days ago, dumped in ditches around the city of Aba in southern Nigeria. Kanu warned that the recent killings suggest Islamic terror groups active in Nigeria are singling out Igbo who identify as Jews or with the local Messianic community. "The discovery five days ago of fresh human corpses inside a ditch along Aba-Port Harcourt Road in Aba, Abia State in Eastern Nigeria has raised fresh concerns and fears over intensified plans or policies to wipe off or exterminate the Judeo-Christian People of Eastern Nigeria; otherwise called 'Igbo/Biafra-Jews'," Kanu told Arutz Sheva. "The intelligence unit of the Indigenous People of Biafra had five days ago (1st February 2019) discovered that fresh corpses of innocent citizens of Judeo-Christian identity killed in custody are routinely dumped inside various ditches across Abia State and possibly other parts of the Eastern Region of Nigeria." The claims were not independently verified, but Kanu cited reports from human rights organizations including Amnesty International and Intersociety: The International Society for Civil Liberites and the Rule of Law regarding massacres of the Igbo minority in 2016, 2017, and 2018.